200 Marriage Care volunteers and special guests came together for 24 hours to share our passion for marriage preparation and relationship counselling and to celebrate the difference Marriage Care has made to people’s lives and the partnerships that have enabled us to do this. 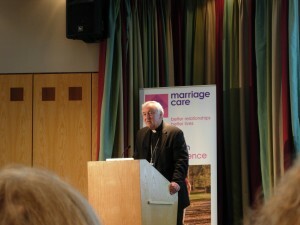 Marriage Care’s partnership with the Church was illustrated by the attendance of Cardinal Nichols who gave the opening speech ahead of the Extraordinary General Synod of Catholic Bishops on the Family in October. He talked of the challenge that Pope Francis has presented the Church in its pastoral care of marriage and family life and acknowledged the significant role that Marriage Care plays. He said ‘the expertise that has been established within the volunteer workforce which supports Marriage Care is considerable and represents an extensive resource for the work of marriage preparation and the care of family relationships’. Marriage Care also announced the strengthening of the partnership between Marriage Care and FOCCUS Inc USA. Marriage Care and FOCCUS Inc have worked closely together for many years, enabling nearly 500 couples a year to receive marriage preparation based on the FOCCUS© questionnaire. Marriage Care’s face-to-face FOCCUS© facilitator training is recognised by FOCCUS Inc to be the ‘gold standard’. It has now granted exclusive rights to Marriage Care for the training, delivery and resourcing of FOCCUS Inc, USA products in the UK. The conference also heralded new partnerships in the pursuit of professional best practice by welcoming Dr Bill Doherty, Professor and Director of Marriage and Family Therapy at the University of Minnesota, who gave two stimulating presentations. He challenged members to think of new ways of creating a cultural mandate that creates ‘FOMO’ – ‘fear of missing out’ around relationship education. He said ‘you can’t create a social movement without the active participation of people in that generation!’ He also shared his development of discernment counselling (when couples do not agree about their future together) and of ‘Marital first responders’. This training is a breakthrough way to help marriages and relationships by tapping into the power of their support networks – the people who care about them. But all of this would not be possible without the gift of time, expertise, dedication and commitment of nearly 800 volunteers and the conference gave an opportunity to recognise their achievements, value their contribution and inspire them for the year ahead.